Not to be confused with Venetians. In science fiction and ufology, a Venusian (/vɪˈnjuːʒən, -ʃən/) or Venerian is a native inhabitant of the planet Venus. Many science fiction writers have imagined what extraterrestrial life on Venus might be like. 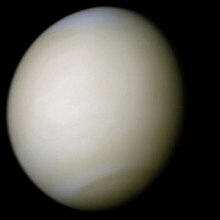 The word Venusian – sometimes spelled Venutian – is a simple combination of the name of the planet Venus and the suffix -ian, formed by analogy to Martian and other similar demonyms. The classically derived demonym would be Venerean or Venerian (cf. Latin: venereus, venerius "belonging to the goddess Venus"), but these forms have been used by only a few authors (e.g. Robert A. Heinlein). Scientists sometimes use the adjective Cytherean for things related to Venus, from the goddess' epithet Cytherea. The similarly derived Venereal is not used due to its association with sexually transmitted infections as "venereal diseases". Venusians appearing in works of fiction are usually fanciful, rather than plausible inhabitants of the planet. Before the mid 20th century, little was generally known about the planet except that it was solid and comparable in size to Earth; its cloud cover obscured remote observation of its environment. This allowed writers to speculate that Venusians might be similar to humans or other Earth species, much as they did for fictional Martians. 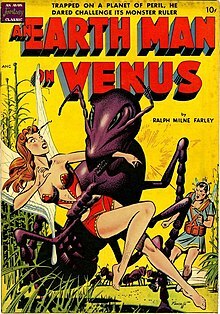 As more was learned about Venus and the implausibility of humanoid or other life on it, Venusians became increasingly uncommon in science fiction. In early Captain Marvel stories, Venusians are giant frog-like amphibians which are ruled over by the evil mad scientist Doctor Sivana and his family. They are used to the tropical jungles of Venus and find Earth cold, and are quite savage. Venus is inhabited by other savage creatures, some which resemble prehistoric beasts, such as the centaur-like Gorillalion (which is half-gorilla half-lion). The Hydrads of Venus, who resemble huge animated sponges, appear in Planet Comics, in the Lost World section. If hurt, water can restore them to health. Though opposed to the Voltamen who have invaded Earth, they are also enemies to Hunt Bowman. In the Superman story which had the first appearance of the Legion of Super-Villains, one of the members was Cosmic King, a scientist who worked on transmuting elements, but when he was struck by the ray he gained the power to send those beams from his eyes. However, he was exiled from Venus for these experiments. In DC Comics' All-Star Comics #13 the JSA are gassed by Nazis and rocketed to different planets. Wonder Woman is sent to Venus and finds it to be inhabited by fairies led by Queen Desira, who worship Aphrodite, and claim to have been at peace for "a million years". She helps them in a war against the Meteor Men, large brutal males. In Showcase #23, Hal Jordan Green Lantern is sent by the Guardians, operating through the power battery to Venus where he meets blue-skinned primitive humanoids who are being attacked by pterosaur-like creatures. He seals the monsters in a cave, and leaves the world, saying the cavemen will one day be a great civilization. In the British comic Dan Dare (1950–1967), Venus is inhabited by green-skinned Treens and Therons, who are separated by a fire wall running across Venus. The Mekon, the Super-intelligent Treen leader is a primary villain. Most Treens are emotionless. The Therons are more friendly to Earth. Minako Aino of Sailor Moon is the reincarnation of the Princess of Venus. The Sailor V Manga shows a diamond shaped structure that is her castle. In the "Venus series" of Edgar Rice Burroughs, Burroughs created a fictitious 'Venusian' alphabet supposedly used by the Venusians (or "Amtorians" - as "Amtor" is what the natives call their planet). His artificial Amtor letters flow nicely together like cursive writing. In Olaf Stapledon's 1930 novel Last and First Men, when the Moon threatens to slowly spiral down to crash into Earth, humans leave Earth and colonize Venus; in the process of doing so, humans totally exterminate Venus' native inhabitants, a semi-intelligent deep ocean marine species. The descendants of the invaders, Sixth to Eighth Men, can be considered Venerians themselves. In Charles R. Tanner's "Tumithak of the Corridors" (1932) and its sequels, Venus is the homeworld of the shelks, spider-like aliens who have conquered Earth and forced most of the few surviving humans underground. In William Lumley and H. P. Lovecraft's "The Diary of Alonzo Typer" (written in 1935 and published in 1938), part of the Cthulhu Mythos, there are mentions of the "Lords of Venus", and conflicting indications that the Serpent People originated there. The story was followed by "In the Walls of Eryx," co-written by Lovecraft and Kenneth J. Sterling, in which a prospector is trapped in a maze on Venus, apparently constructed by lizardmen. In C. S. Lewis' book Perelandra (1943), Professor Elwin Ransom travels to Venus (the title is the name of the planet in the Old Solar language), a planet mostly covered by water with floating islands on it, in order to fight a possessed Professor Weston and prevent the "Adam and Eve" of this young planet from bringing about the same fate that befell Earth (Thulcandra). In the book, Lewis depicts a wide variety of flora and fauna, with some animals close to being sentient. The King and Queen of the planet are humanoid, but green, and their commandment is for them not to sleep on the fixed land, a still island. When this happens, the Oyarsa of this world, a type of angel-like being who seems feminine like the classical goddess, tells Ransom that this will be the start of a new age. Before Eden, by Arthur C. Clarke, is about a manned expedition to Venus which discovers an animated form of plant life. However, after the humans leave, the creature eats their abandoned garbage and other things left behind and this contamination eventually wipes out all native life on the planet. The Space Merchants is a science fiction novel, written by Frederik Pohl and Cyril M. Kornbluth in 1952, about the campaign by advertising agencies on an overpopulated Earth to convince humans to colonize Venus, which is depicted as having a harsh and stormy tropical climate. "I Am the Doorway", a short story in Stephen King's 1971 collection Night Shift, concerns an astronaut who returns from a tragic mission to Venus to find himself possessed by a murderously terrified alien entity. In Roald Dahl's Charlie and the Great Glass Elevator (1972), Willy Wonka says that Venus used to be home to an alien race before they were "gobbled up" by Vermicious Knids. In Jacqueline Susann's romance Yargo (1979), Venus is said to be inhabited by bees that are as big as horses. In the self-help book by John Gray, Men are from Mars, Women are from Venus, women are occasionally (metaphorically) referred to as Venusians, while men are referred to as Martians. In the book Venus by Ben Bova, the inhabitants of Venus are strange snake-like creatures that use molten sulfur for blood. They are not sapient. There are also micro-organisms in the clouds that break down ceramics and metals. In Heinlein's story "Logic of Empire" the Venusians are an intelligent but primitive race of amphibians who trade valuable swamp roots to the human colonists in return for tobacco. In the novel Podkayne of Mars (depicting a fairly different Venus) Venusians are humanoids of great physical strength but also very primitive. The Gobsmacking Galaxy, an entry in the children's non-fiction series The Knowledge written by Kjartan Poskitt, humorously describes hypothetical alien life forms which might evolve on planets in the solar system; the Venusian creatures are small, squat and round to cope with Venus's atmospheric pressures and make their living selling life insurance to visiting astronauts (before they succumb to the planet's extreme heat and pressure). In Frederik Pohl's "Gateway", humans travel across the Galaxy using spaceships found on planet Venus, left there by its ancient civilization. The creature in It Conquered the World (1956) was from Venus. It resembled a cone with a nasty grin. It Conquered the World was remade as Zontar, the Thing from Venus (1966), whose villain was also an alien from Venus. 20 Million Miles to Earth (1957) deals with the crash-landing on Sicily of a spaceship returning from an expedition to Venus and the resulting rampage by a creature which it brought back. The creature (called in production, but not in the film, a "Ymir") is a reptilian humanoid with perhaps the intelligence of a chimpanzee, which under Terran conditions grows to roughly 20 feet tall. The film was animated by Ray Harryhausen. Queen of Outer Space is a science fiction movie filmed in 1958 starring Zsa Zsa Gabor as Talleah, the Venusian leader of the resistance to overthrow cruel Queen Yllana. In the film Easy Rider, Jack Nicholson's character speaks of Venusians around a campfire after smoking marijuana. Venus Wars is a 1989 science fiction anime film about life on the planet Venus in the year 2089 after it has been colonized by humans. In the original Japanese version of Ghidorah, the Three-Headed Monster, Princess Selina Salno of the fictional country of Selginia claims to be a survivor of the destruction of Venus by King Ghidorah. Venusian visitors sometimes appeared on The Twilight Zone, (including the episodes "Mr. Dingle, the Strong" and "Will the Real Martian Please Stand Up? "), as a means of further twisting stories already featuring Martian visitors with similar goals. In "Will the Real Martian Please Stand Up?," a Venusian appears disguised as a human chef with three eyes where the third eye is under his hat. Although never seen or actually discussed in Doctor Who, the Third Doctor was a master of a martial art known as Venusian Aikido (or Karate). Also, the Doctor spoke the words of a Venusian lullaby in "The Dæmons", sang the lullaby (to the tune of "God Rest Ye Merry Gentlemen") in The Curse of Peladon, and was shown to carry a toothbrush containing "Venusian spearmint" in "The Shakespeare Code." In the spin-off novel Venusian Lullaby, the Venusians are revealed to be from our Solar System's distant past, before Venus had become the hellish world of today. Venusians work as members of the united galactic organisation in the 1962 television series Space Patrol. In the first episode of the show Futurama, graffiti written in "Alien Language 1" is translated "Go Home Venusians". In the second episode of Challenge of the Super Friends, Venus is shown to be inhabited by an advanced civilization called the Fearians. The Fearians are depicted as having three-heads with green skin and red eyes. The Fearian Leader (voiced by Michael Bell) form an alliance with the Legion of Doom, who trick the Super Friends into changing the world so it can support Fearian life. This will allow the Fearians to form a colony and the Legion will rule the world. The Super Friends are trapped by the Fearian Leader in a force field. However, Green Lantern makes them invisible, causing the Leader to think they have escaped and turn off the field. He is defeated by Black Lightning and Green Lantern sends him back to Venus. The Super Friends then restore the world. In National Kid, the Inca Venusians are an alien race who National Kid defends the Earth from. In the 1950s a group of contactees told stories in which they claimed to be in contact with friendly, light-haired, light-skinned humans from the planet Venus, as well as other planets in Earth's solar system. The first contactee, and the most famous, was George Adamski of Palomar Mountain, California. He claimed that on November 20, 1952 he met a Venusian named Orthon in a California desert. Adamski said that Orthon communicated with him via telepathy about the dangers of nuclear war and that he left behind footprints with mysterious symbols on them. Adamski also displayed numerous photographs that he claimed showed the Venusian UFOs, and he said some of the photos had been given to him by Orthon. Copies of these photos were sold to visitors at Adamski's campground and restaurant at Palomar Mountain, but later studies by UFO investigators indicated that the photos were fakes; one scientist who analyzed the photos of a Venusian "scout ship" said the UFO's "landing struts" were General Electric light bulbs. Adamski wrote or co-wrote three books in the 1950s and early 1960s about his meetings with Orthon and travels in a Venusian UFO through Earth's solar system; the first two books, Flying Saucers Have Landed (1953), and Inside the Space Ships (1955), were both bestsellers. Following Adamski's story, others, such as Howard Menger, George Hunt Williamson, Truman Bethurum, George Van Tassel, and Daniel Fry, also wrote books and gave lectures in which they claimed to have met similar friendly, light-skinned humanoids from Venus and other planets in Earth's solar system, and to have taken trips with them in their spaceships. These humanoids were later called Nordic aliens. Throughout the 1950s and 1960s the contactee movement garnered some popular interest through books, lectures, and conventions, such as the annual Giant Rock UFO conventions in California. In May 1959 Adamski had a private audience with Queen Juliana of the Netherlands to discuss his claimed UFO experiences, which caused some controversy in the Netherlands. However, numerous investigations of the contactee movement revealed many flaws and inaccuracies in the contactees' claims that led most researchers to conclude that their stories were hoaxes. Among the pieces of evidence noted by critics was that Venus has an environment that is extremely hostile to human life, and that none of the other planets in Earth's solar system are capable of supporting humanoid life. Also, investigators such as USAF Captain Edward J. Ruppelt, the head of the Air Force's Project Blue Book, and ufologist James W. Moseley, conducted extensive investigations into the claims and backgrounds of Adamski, Williamson, and other contactees, and concluded that they were either con artists or simply not being truthful in their stories and claims. In the teachings of the UFO religion the Unarius Academy of Science, the capital of Venus, which, like the Venusians themselves, is said to exist on a higher vibratory plane, is called Azure. Theosophical guru Benjamin Creme subscribes to the Theosophical view that the Nordic aliens (like those seen by George Adamski—Creme accepts Adamski's UFO sightings as valid) pilot flying saucers from a civilization on Venus that exists on the etheric plane (Theosophists believe that since the Venusians' civilization is on the etheric plane, the heat does not affect them) and are capable of stepping down the level of vibration of themselves and their craft to the slower level of vibration of the atoms of the physical plane. It is also believed in Theosophy that the governing deity of Earth, Sanat Kumara , is a Nordic alien originally from Venus. Sanat Kumara is said to live in a palace in a mythical city on the etheric plane of Earth called Shamballa, which is said by Theosophists to be located above the Gobi Desert. ^ Burroughs, Edgar Rice (2001). Pirates of Venus (Cmv ed.). Bison Books. ISBN 978-0-8032-6183-9.